The album kicks off with ‘Spacialize’ exhibiting hypnotic loops. ‘Orbitron’ follows on, more subtle stuff, with bleeps and Detroit style high synth pads. A steady shuffle with a crunchy kick drum that promises a bit more but doesn’t quite smash through with it. ‘Increment’ is a topsy turvy rhythm building into more solidified form. The shifting rhythm, going out of sync with itself in a minimalist style. A Lackadaisical synth, electrified with white noise, reverberates through the track. ‘Blind Eye’ contains string chords, rattling sounds and a smooth synth on the calmer side of acid. ‘Nep-tune’ examines the pseudo- ¾ time rhythm that has become ubiquitous in techno, with the stress placed in the second beat of three. ‘one TWO… three’ Makes for a nice rolling sensation, as if the dancefloor were figuratively or more likely literally moving under you. A great swing to the motion. I have walked over suspension footbridges before and felt a similar sensation. A noisy synth overlays. Some burbling and delay’d synth adds a dub strength to the mix. 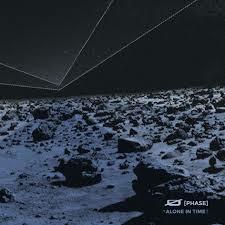 ‘Alone in Time’ is more hynoptic trypno, the resonant chimes playing in and out of each other. There are no kicks on this and lots of high frequency static swashes. Some niggling tremulous pulses at the edge of hearing keep it sweet with the clicks and hi hats. ‘The Maze’ is a standout track from the album. Darker sounds and more expansive long release synthesisers. The bassline is menacing. In the middle is a quality breakdown to get fists pumping in the air! The kicks are squashed with a crunchy drum added to it. This is very good atmospheric building techno. To be listened to on space stations and in observatories.